Experience daily luxury with our Nature's Extracts collection. This moisturising hand and nail cream enriched with extract of fig will help hydrate even the busiest hands, leaving them soft and delicately scented. Directions: Massage into hands paying particular attention to nails and cuticles. Ingredients: Aqua, Cetearyl Alcohol, Stearic Acid, Paraffinum Liquidum, Ceteareth-20, Glyceryl Stearate, PEG-100 Stearate, Sorbitol, Parfum, Polysorbate 20, Benzophenone-3, Carbomer, Disodium EDTA, Propylene Glycol, Butyl Methoxydibenzoylmethane, Sodium Hydroxide, Ficus Carica (Fig) fruit extract, Hexyl cinnamal, Limonene, Phenoxyethanol, Methylparaben, Propylparaben, Ethylparaben, Butylparaben. 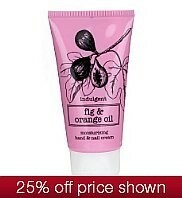 Pretty good hand and nail cream that has a really nice gorgeous scent. Easy to use and massages easily enough into the hands. Did not leave hands as moisturised as I would have liked but for a cheap quick moisture surge, this is not bad. Would recommend it, the scent is lovely. Its nice I like the scent more than anything else but wouldn't buy again i'm afraid. The smell is its best feature and also the pretty look of the tube. Not hydrating or moisturising enough for my hands which is a disspointment.